Pityriasis versicolor is one of the conditions which we see a lot of. It is caused by the growth of a yeast which is actually part of our normal skin microflora called Malassezia. Small numbers of the malassezia germs that causes pityriasis versicolor commonly live on the skin and do no harm. However, some people are prone to this germ multiplying and spreading on their skin more than usual or becoming activated, which then leads to a rash developing. In some cases, hot, sunny or humid weather seems to trigger the germ to multiply on the skin. This is because the yeast is dependent on oils or lipids for survival which is why it is found in our oily or “sebaceous” areas such as the chest and back most commonly. 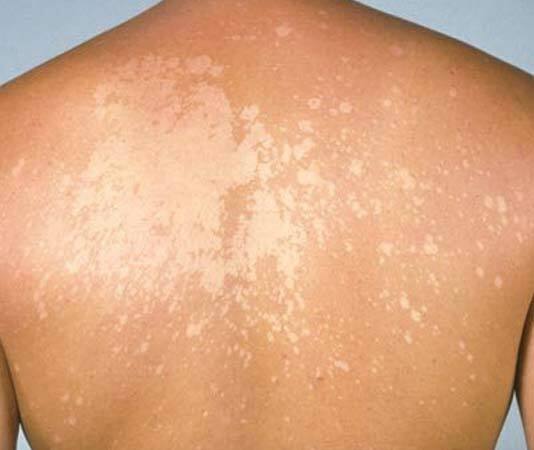 It appears as white or brown patches on the skin which become scaly if you stretch the skin. It is important to note that it is not possible to catch this condition from another person. Your dermatologist at Atlantic Dermatology and Laser will spend time explaining exactly how to treat this condition and will emphasise that following treatment, the colour of the affected skin usually takes 2-3 months to return to normal. As long as the rash is not scaly, this still means that the treatment has been successful. We will also counsel you on how to prevent the rash from recurring following your treatment One option is to apply a medicated shampoo or cream to your skin every 4 weeks. This may keep the germ away, or prevent the numbers from building up, which will prevent the rash from recurring. Alternatively, if you have frequent recurrences then you may be advised to take antifungal tablets for one day each month as a preventative measure.